They do know the definition of exponents. It’s written a line above. They did it a line above. They’re doing this with confidence. There aren’t erased numbers. This isn’t slow thinking. 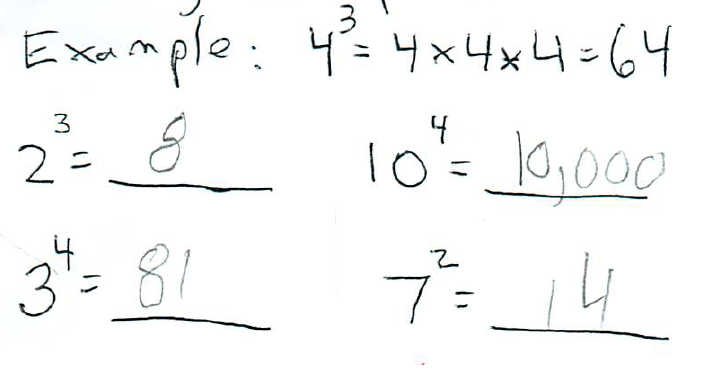 This is just what kids think seven squared ought to be. By defining exponents in terms of multiplication while offering no other images or models for what exponentiation does, we create a default model for exponents that sticks with people forever. 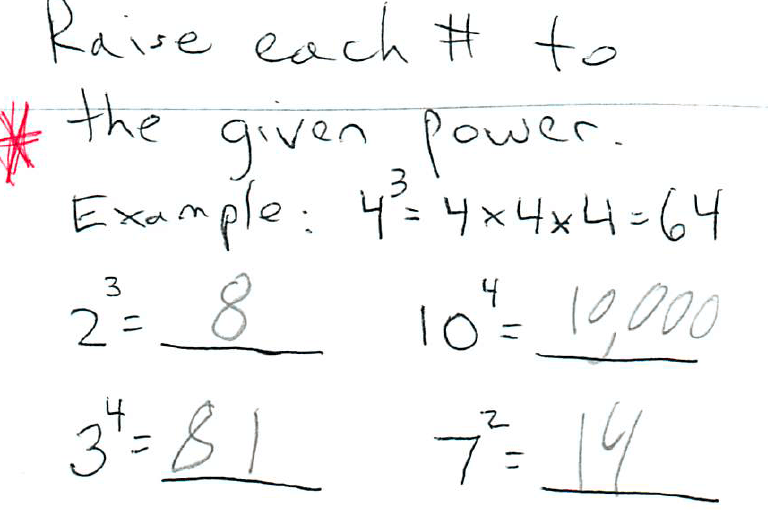 When mentally taxed — either with a tough multiplication, or with an unusual power — kids revert back to this default model. They’ll do this especially in high school, and they’ll get questions wrong on tests and all sorts of other things not because they’re being sloppy, but because this default model is constantly lurking in their minds. I’ve written about a lot of this stuff before. See here, especially, where I shared the high school versions of this mistake. 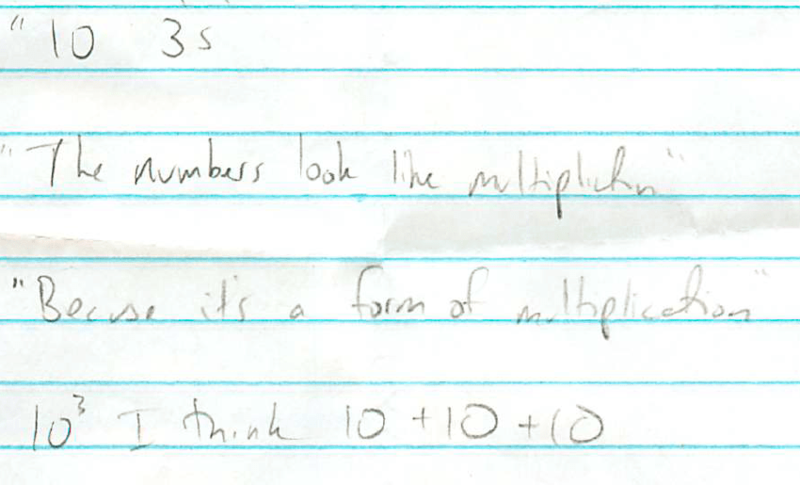 Now that all of this has been established, the next step needs to be finding a curricular approach that doesn’t rely as heavily on the “repeated multiplication” model for exponents. 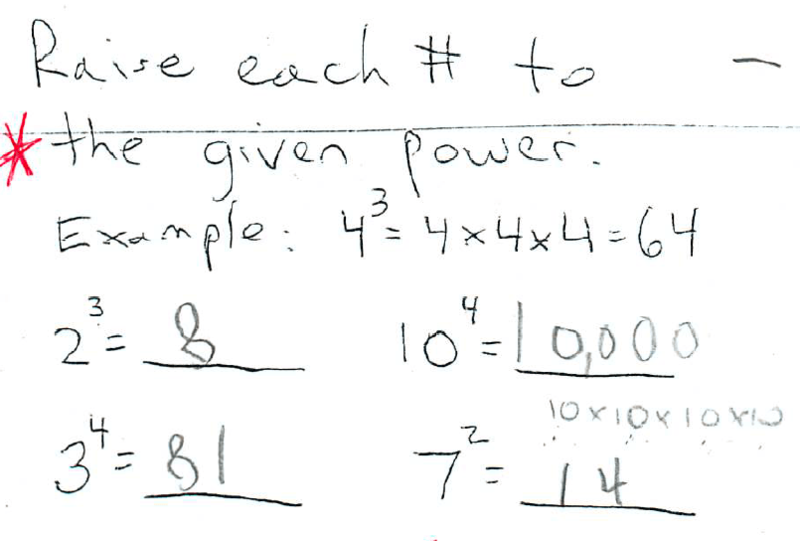 We need to build a distinctive set of images and intuitions that are native to exponents so that our kids aren’t always defaulting into multiplication when they have to think hard about math. 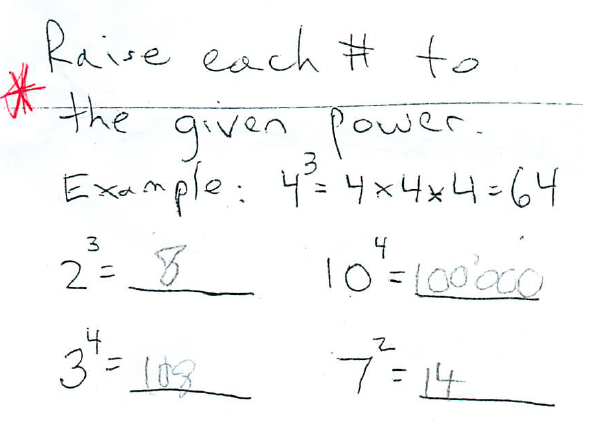 We tend to think of four, not five, major operations of arithmetic, but we need to start thinking about exponents as on par with all the others and taking care to build them thoughtfully throughout the entire curriculum. Beyond all of this, these exponents mistakes serve as a big reminder about the nature of learning, teaching and knowledge. The big, big lesson of all of this is that knowing/not-knowing is not clean and it’s not binary. There are degrees of knowing something. 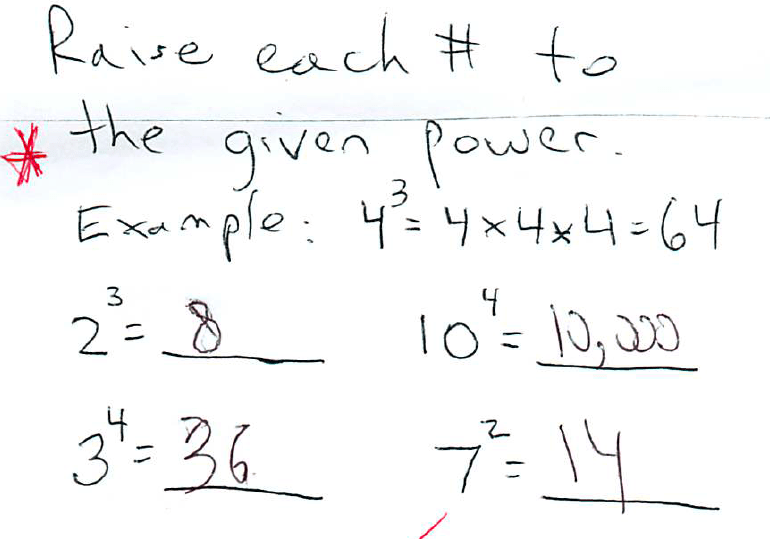 Would you say that these students don’t yet understand what exponents mean? What does that even mean, given the contradictory evidence we have in front of us. But, then, what does it mean to understand something at all? Posted in Exponents, Numbers & Operations in Base 10.